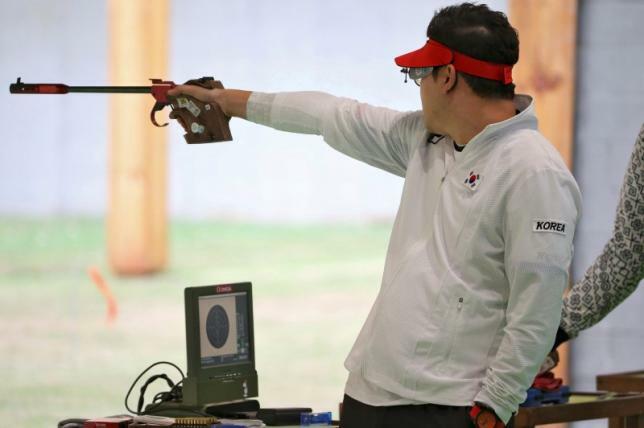 South Korea’s Jin Jong-oh shot his way back from near elimination to win the men’s 50 metre pistol event on Wednesday and become the first shooter in Olympic history to win a specific event at three Games in a row. With a steadier hand in the final rounds, Jin prevailed over Vietnam’s Xuan Vinh Hoang, a 41-year-old who made history on Saturday by winning his country’s first-ever gold medal, in the 10 metre air pistol. The crowd cheered the exciting comeback by the 36-year-old Jin, ranked No. 1 in the world. He is one of the Olympics’ most decorated pistol shooters, having won the 50 metre titles at Beijing and London, where he also claimed the 10m air pistol event. Having qualified in first position out of eight, Jin got off to a wobbly start. A third of the way through the competition, he was nearly five points behind the leader Hoang, and at risk of being cut. With the cool head of a four-time Olympian, he gradually closed the gap as Hoang faltered, and surpassed him in the final rounds, ending with 193.7 points to Hoang’s 191.3. North Korea’s Kim said he had hoped to do better than bronze, his country’s third shooting medal.